epiQ Tracks® S200 surface, installed by Hellas in 2013. “We were highly impressed with the quality of work Hellas put into our track project in 2013, so as a very satisfied customer it was a no-brainer to seek Hellas' bid to complete the field renovation portion of our site improvement,” said Nisbet. The King’s Academy turns again to Hellas’ sports surface expertise to upgrade the football stadium. The $1 M project will be a Design/Build, and Hellas’ Preferred Turf System, which includes Matrix® Turf with Helix and Geo Plus organic infill, will be installed. This outdoor turf system allows for the best playing conditions in any weather. The Geo Plus infill is an essential component for The King’s Academy’s California location, and has proven to cool field temperatures by at least 40 degrees. “With the reliable design/build approach Hellas is able to provide, we feel confident about the product recommendations and engineered design that was proposed for our specific project. We know satisfaction 2.0 is right around the corner!” said Matt Nisbet, Director of Operations at The King’s Academy. 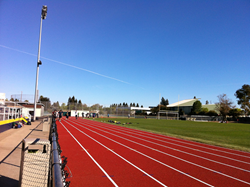 In 2013, The King’s Academy selected Hellas Construction to install epiQ Tracks® S200 as well as a field events area, raising the game for TKA track and field athletes, as well as visiting competitor teams. “Hellas is glad to be back at The King’s Academy to continue our relationship and make further improvements to their sports facilities,” said James Towsley, Business Development Manager. About Hellas Construction Headquartered in Austin, TX, Hellas Construction, Inc. is one of the largest sports construction contractors in the United States. While specializing in the general construction of sports facilities and synthetic surfaces, Hellas also champions innovative artificial turf manufacturing, base construction, field, track and tennis planning, installation and maintenance. To learn more about Hellas Construction, visit hellasconstruction.com. About The King’s Academy A private, Christian junior and senior college preparatory high school located in Sunnyvale, CA. Founded in 1991, the school first opened with only 29 students. Currently, TKA has more than 930 students enrolled.